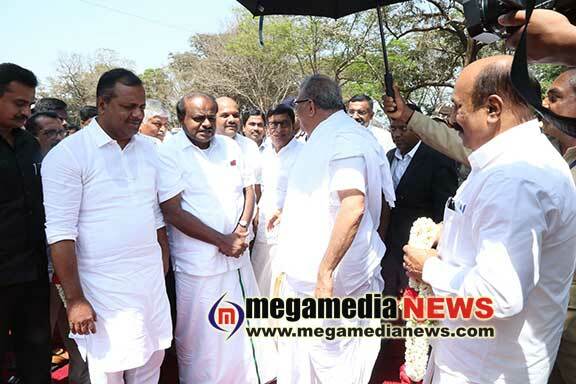 Mangaluru : Chief Minister HD Kumara swamy inaugurated the first phase of work on Netravathi-Dharmasthala four-lane road as part of the public welfare programmes launched on the occasion of fourth Mahamastakabhisheka Mahotsava of Sri Kshetra Dharmasthala Bhagawan Sri Bahubali on Saturday. “The ‘Nyaya Peetha’ has its own sanctity. Earlier, I got involved in a pledge in the aftermath of political development in Karnataka,” he said referring to the pledge made by B S Yeddyurappa at Dharmasthala. Describing the bond between Kannada culture and Jainism, the chief minister highlighted the contributions of poets, philanthropists and scholars like Sri Vijaya, Danachintamani Attimabbe, Samantabhadracharya and Nagakotyacharya to Kannada literature. “The monolithic statue of Bahubali stands for the values of peace and sacrifice. Sri Kshetra Dharmasthala which is famous for religious harmony is known for its contribution towards rural development too,” he said. 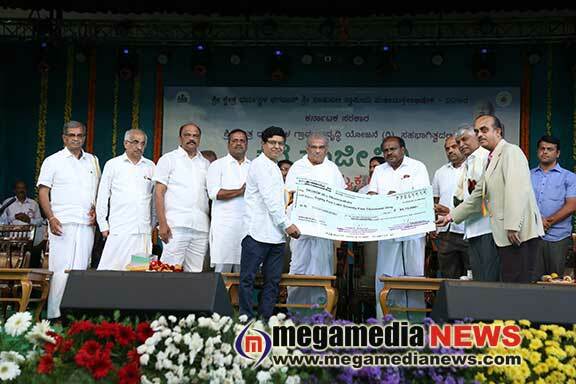 Dharmasthala Dharmadhikari D Veerendra Heggade and Kumaraswamy exchanged the memorandum of understanding signed for the rejuvenation of lakes under Kere Sanjeevini programme of the state government. On the occasion, Minor Irrigation Minister C S Puttaraju said that Rs 35 crore has been sanctioned to 17 districts. As many as 34 out of the 93 lakes are rejuvenated in the first phase of the programme. An amount of Rs 28.50 crore has been earmarked by the government and released through the Lake Development Authority already. This apart, the Lake Users’ Associations set up in 10 taluks in various districts. A maintenance cost of Rs 1 lakh each is provided to the associations, he added. Lauding the immense contributions made by Heggade in terms of spirituality and societal development, Pejawar Mutt seer Vishwesha Theertha Swami said that he should be felicitated with Bharat Ratna Award. He said that Sri Kshetra Dharmasthala is probably the first religious shrine in India where one can witness the confluence of Shaiva and Jain traditions. The seer described that both, Lord Shiva and Lord Bahubali are the epitomes of ‘Vairagya’, he said. He said Mahamastakabhisheka is a rare divine feat where the statue of Bahubali will be offered ablutions and the devotees will have the ablution of devotion, knowledge and enlightenment for themselves. “Bahubali is like a polar star. Nobody can scale his height. But, all can follow the direction by looking at it. Bahubali guides us in the path of righteousness,” he said. He complimented the chief minister for presenting a pro-development budget. The seer said that the allocations for the fields of religious and agriculture are laudable. 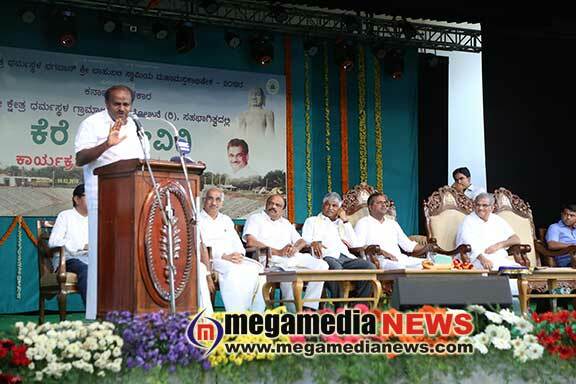 Presiding over the programme, Heggade said that Sri Kshetra has been launching public welfare programmes during the Mahamastakabhisheka. He said the Pejawar seer has graced all the four Mahamastakabhiasheka programmes at Dharmasthala. Union Minister for Statistics an Programme Implementation D V Sadananda Gowda released the souvenir ‘Kevali’ on the occasion. Cooperation Minister Bandeppa Kashempur inaugurated an exhibition on millets. The postal department released a first-day cover on Mahamastakabhisheka. District in-charge and Urban Development Minister U T Khader, Beltangady MLA Harish Poonja, MLC Harish Kumar, MLC B M Farooq and SKDRDP Executive Director Dr L H Manjunath were present.